Narendra Modi will address the concluding session of the two-meet - also being billed as the last such massive interactions of party leaders before the polls. NEW DELHI: The BJP is holding a two-day National Convention of its top leaders, office bearers, elected legislators and district level chiefs here. On the inaugural day on Friday, the party adopted two resolutions - one on Agriculture and farm issue and the other on Social sectors - underlining the party's concerns and attempt to focus on the growing concern over farmers' distress, loss of income in rural areas, disgruntled upper castes and jobs especially in the context of ensuing general elections. 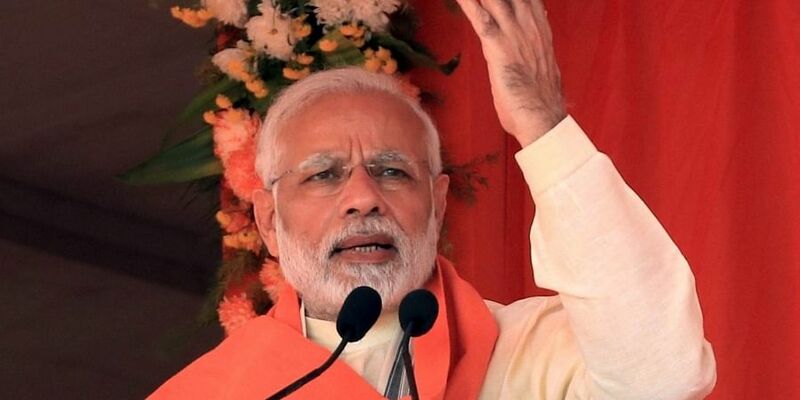 Prime Minister Narendra Modi on Saturday will address the concluding session of the two-meet - also being billed as the last such massive interactions of party leaders before the polls. The decision to reserve 10 per cent seats for general category applicants for government jobs and education in government institutions, was described as a revolutionary and historic. "This benefit will be available to the poor of all communities and religions and to groups who were not getting reservation up till now like Brahmins, Baniyas, Kapus, Marathas, Patels, Jats and Rajputs," said the resolution on social sector moved by External Affairs Minister Sushma Swaraj - highlighting party's focus to reach out to a large section of the electorate. "The government has taken a revolutionary and historic decision for the poor and middles classes of the country...The benefit will be made available to the poor of every religion and to groups who were not getting reservation up till now," the resolution titled 'Garib Kalyan' said. In the resolution passed on the welfare of farmers moved by Union Minister and senior party leader Rajnath Singh and seconded by Maharashtra Chief Minister Devendra Fadnavis, the party lauded the Modi-led government's policy-based, holistic approach to agricultural growth and farmers' welfare. Highlighting the various initiatives taken by the Modi government, Home Minister Mr Singh said a provision of 14 lakh Crore rupees has been made in the budget for strengthening rural economy. He said, during 2018-19, the government has enhanced the agriculture credit to 11 lakh crore rupees. He said, the Prime Minister has set a target to double the farmer's income by 2022. The second resolution dwelt on social sector the welfare of the poor. Moving the resolution, Ms Swaraj said the NDA government's schemes, such as Jan Dhan Yojana and Ujjwala Yojana, are aimed at uplifting the poor and empowering women. Ms Swaraj said the Prime Minister Narendra Modi demonstrated his will power to provide bank accounts to a large number of population through Jan Dhan Yojana. Earlier, in his presidential address, BJP chief Amit Shah said, the bill providing 10 per cent reservation in jobs and education to Economically Weaker Sections in general category will benefit crores of youth. Seeking another term for BJP-led government at the Centre, the BJP Chief termed the present dispensation led by Prime Minister as transparent, corruption-free, decisive and sensitive. He assured the nation that economic offenders, such as Nirav Modi, Mehul Choksi and Vijay Mallya will be brought back to the country to face the law. In his spirited presidential address, Mr Shah waxed eloquent on key political issues and slammed the Congress and Trinamool Congress even as he made a strong pitch for Ram Temple via 'constitutional route'. "We have said that through Constitutional route only Ram Mandir will be constructed. But Congress is not leaving a single chance to create hurdle," Mr Shah said amid chanting of 'Bharat Mata Ki Jai' among the leaders and workers. The underlining of a roadmap for Ram Temple, the BJP strategists feel, will help the right wing party consolidate its core vote of upper castes in the Hindi-speaking states - where it suffered erosion of support base lately. Near the venue scores of party workers including women were seen carrying hoardings and posters and raising slogans. "Our victory is certain in 2019," Mr Shah said in presence of Prime Minister Modi and others. The two resolutions adopted by the party at the convention do reflect the party's political concerns after the loss in the three Hindi heartland states of Madhya Pradesh, Rajasthan and Chhattisgarh. The BJP lauds its government for 'successfully' working out issues of farmers' income. 'New India' that we are trying to create, we will not just be able to reach the goal of doubling of farmers income but would also be looking forward from there...the resolution on farm issue said.